A few years ago I thought it might be a good idea to start a blog. After all, I have things to say – right? But when the access was put on the web I found myself with a terrible lack of things worth saying. I thought about it, thought some more, and continued thinking but nothing came to me. Zilch, zero, nada! Then an amazing thing happened – my husband began to respond to questions he posted on Facebook, and his lengthier explanations found themselves into a blog he started. How could this be, I wondered. I certainly could not let him be the only one in our family with a voice. So I revisited the idea once again and found my answer for my first attempt at blogging – be it ever so humble. 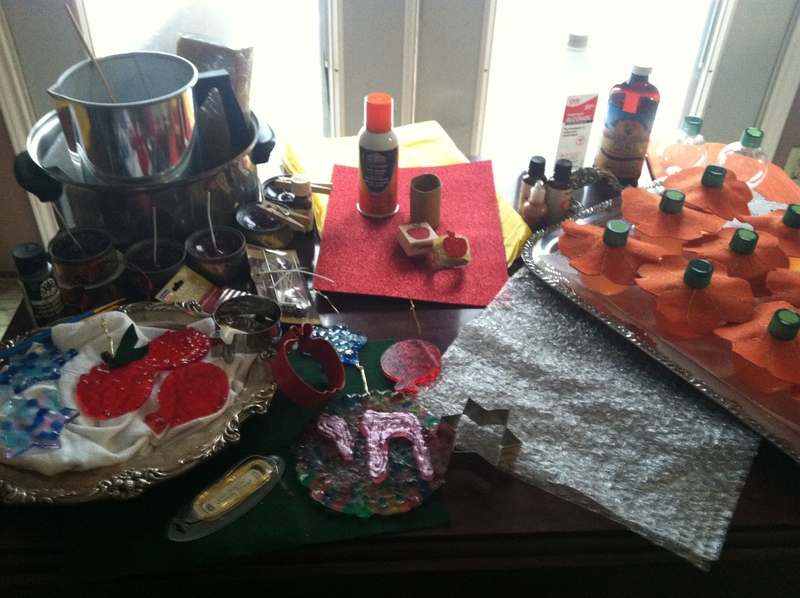 I thought I would explain some things I am preparing for our local group for the upcoming fall festivals. This year we will be going to Brad and Cindy’s for Ma’ariv, dinner, and services the next day. As I trust Cindy on her food preparation, I will not have to cook all the meals myself. Of course, I will bring a few items and help out where I can. Believe me, I know what an undertaking she has ahead of her. But it is nice this year to spend more time thinking about the festivities rather than the food. Now, I love to entertain (insert appropriate southern accent here), but rarely have the finances to do what I would really like to do. I also like guests to learn something from the experience, or have a memento to take home with them to remind them of the time they spent with us. I realize that people don’t want more junk to clutter their lives, but a little effort and color can go a long way in celebrating the festivals. And I have learned over the years that people really do appreciate the effort put into a well-thought table or party favor. Therefore, I want to do my part in making our celebration as festive as possible and give those who attend something to remember and take home with them. What they choose to do with said items is up to them: whether they keep, use, or toss into the ‘pits of despair’ (that’s the garbage can, ya’ll). Now I have to be honest. None of these ideas came from me alone. In fact, almost everything was at least inspired by other ideas I had seen on the web. My job was to take the idea, modify it to our festival specifications, then streamline the cost in order to make it more affordable. Did I mention that we have limited resources? The truth is that most people are the same way. What an excellent opportunity to stretch our creativity! Our local group is small, but it is an excellent time to invite others to participate who are less familiar with the services and celebrations. 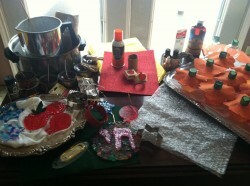 Most of my efforts have been applied to Rosh Hashanah, giving thought to Yom Kippur and Sukkot soon to follow. I will give a brief overview of all the ideas I am working on currently, and then a breakdown of the specifics on materials and how-to. All of these projects are meant to be used as party favors, adding to the table decorations or handed out between services, for Rosh Hashanah. This idea came to me as I kept seeing a small bottle of citronella essential oil mixed in with my other oils. I never used it, but felt that if I didn’t soon it could become ineffective (or maybe even rancid as I am unfamiliar with this oil). This bottle of essential oil is really intended to be mixed and sprayed as a mosquito repellent, but I had never used it that way. Anyway, my original plan was to make small candles as party favors at a Shabbat meal gathering during the summertime. I thought it was timely as people like to spend more time outdoors and barbeque, etc. Regrettably, we had been unable to have people over for Erev Shabbat this past summer. There was just too much going on with us (the recent loss of my mother) and scheduling was inflexible (is that a word?). Then it hit me – Sukkot! We have always joked about how hard it is to have a sukkah where we live. Oh, we’ve done it, but we have always expressed that some years we have said blessings, took one of bite of food, then made a mad dash to get back indoors before mosquitoes could carry us away. These days we spend virtually the entire festival out of town (and love it, by the way) but we do not want those in our local group to feel abandoned or forgotten. So I took my idea of the citronella candles and adapted it for use as a party favor in our Rosh Hashanah dinner to inspire the recipients to use during the festival of Sukkot. It had been a long time since the last time I made candles, but how hard could it be? After all, when I was in high school my Latin Club made hundreds using crayons, paraffin and buckets of sand. Of course, that was many, many moons ago and I was hesitant to use paraffin or crayons. In addition, I talked with a professional candle maker and found that you really have to be careful with some essential oils – specifically citrus, when using in candles. Therefore, I researched on the web and came up with a plan that I thought would not cost too much and use some of the oils I already had on hand. The first thing I needed was an appropriate container to house the melted wax. I wish you could have seen the look on Joe’s face when I put 6 small cans of tuna fish on our grocery list. Then you would have wondered about the look on my face when he came back with an even smaller can – the snack size! However, the more I thought about it, the snack size would be perfect because it would use less wax (being a much smaller candle) and other ingredients, plus there was the added feature of a pull top lid, making the top much less likely to cut fingers than cans opened with a can opener. Another benefit of these very small cans is that the label was paper and glued onto the can. Just a word of caution, it may take a while to save enough cans, depending on the number you need, and they can easily be lost. We still laugh when we remember how the boys (actually young men – sons) came over one day and raided our pantry while we weren’t looking. Anyway, many tuna fish sandwiches later I present what worked for me and our circumstances. You will need: cans or small jars, wicks (the smaller ones are less expensive) wax (1.5 pounds filled 10 of those small tuna cans), oils of choice (I used citronella essential oil, orange essential oil, and cinnamon fragrance oil), colorant (I used the real stuff in the candle making department of the local hobby store because I wanted to be sure it had no fragrance and would hold up well when the wick is ignited), a pot or can dedicated to melting wax, another pot to boil water, a bamboo skewer, ribbon, glue, and clothespins. Instructions: I made about 5 at a time, that way I would only have to melt about .75 pounds of wax. Cut several strips of decorative ribbon (I used a glittery gold that is slightly smaller in width than the cans) and glue to the cans. This covers the glue marks left by the original tuna wrapper and gives the cans a more decorative look. I used clothespins to hold the ribbon in place until the glue dried. Boil some water in a pot. When it comes to a boil, turn down the flame to low or simmer. Place wax in the dedicated can or other pot. I broke mine up into chunks to facilitate the melting time. 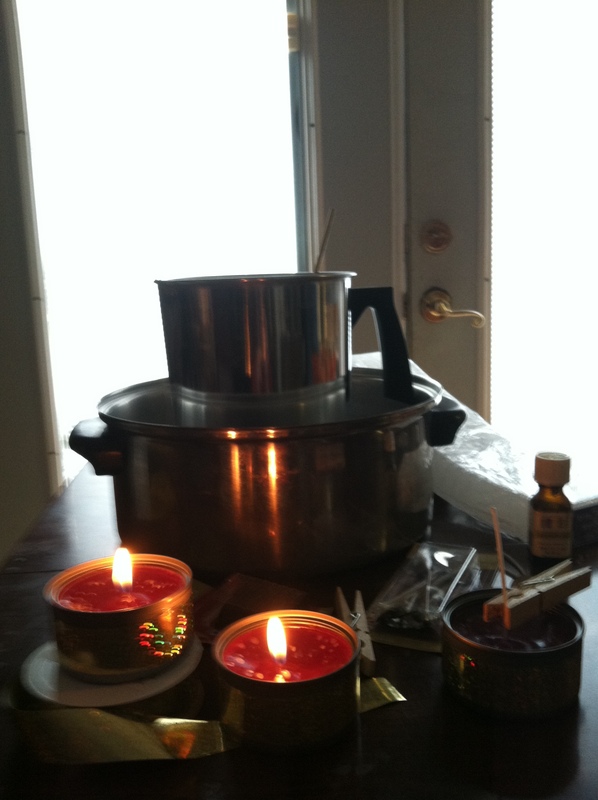 Never leave the room while the wax is on the stove. Very important also, never put the pot with the wax directly over the flame. You want the hot water to melt the wax, not the burner or flame from your stove. Place wicks in the bottom of the cans. Some of the smaller wicks are pretty free standing, but a drop of glue could help to stabilize it. After the desired color is achieved, turn off the burner. Finally, add the oils. For .75 pounds of wax (about 5 snack size cans worth) I used 12 drops of citronella oil, 6 drops of orange oil, and a couple of small dollops of cinnamon fragrance. Stir again with the bamboo skewer. Pour the melted wax into the cans. If the wicks begin to move, bend, or sway, just secure with a clothespin, balancing the pin on the side of the can. Let them harden and cool, then trim the wicks. It is also a good idea to have a box of baking soda handy just in case something catches fire. Wax is highly flammable and does not mix with water. So never pour water onto spilled wax. This also explains why I decided to make my candles in small amounts. It takes longer to get as many as you need, but the element of accident or carelessness diminishes. You will need: red translucent pony beads (found at most Hobby Lobby or Michael’s or other craft stores), metal cookie cutters in the shape of an apple and pomegranate (ok, I really cheated on this one. I thought it was a pomegranate until Yael pointed out to me that it was really a balloon. ), aluminum foil, cookie sheet, green felt or fabric leaves, brown paint to paint the stem of the apple,and a bamboo skewer. Preheat oven to 375 degrees. Place a layer of foil on the cookie sheet and make sure there are no tears or wrinkles. Place cookie cutters on the sheet. I may also mention that I also used some 6-pointed star cookie cutters and used blue and clear beads for them. Then I really went wild and got out my Alef-Bet cookie cutters and did a couple of sheens and a couple of sets of Chet and Yod (to spell ‘Chai’ – the word for life. Of course, the Sheen is a symbol of ‘El-Shaddai’). I also want to mention that I purchased a couple of bags of just red beads, but also a bag of mixed. We separated the reds from that pack, and also the greens for the apples. Just remember that if you want a sun catcher, then the translucent or clear colored beads must be used, otherwise the design will not be penetrated by the sun. Carefully place cookie sheet in the oven and bake for about 35-40 minutes. I checked mine every few minutes toward the end to see how well they melted and check for holes, etc. If there is a hole, place another bead there (use a toothpick or skewer to place) and melt for another 5-10 minutes. Sometimes, after about 25 minutes, if there was a hole toward the edge, I used the blunt end of the bamboo skewer to tap and squeeze a lump into the hole. Just be careful not to burn yourself. Once they are done, remove from the oven and let cool for several minutes. They should pop out of the cookie cutter easily. A small hole could be drilled into the top to thread a string in order to hang. I tried glitter to spruce one up, but found that I preferred them the way they came out of the oven. I know they are a bit lumpy in places, but I think that’s kind of neat. 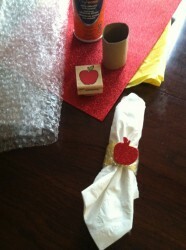 Touch up the apples with brown paint on the stems and glue leaves (or cut leaves from the felt and glue to the top). Thread wire, string, fishing line or ribbon to hang. 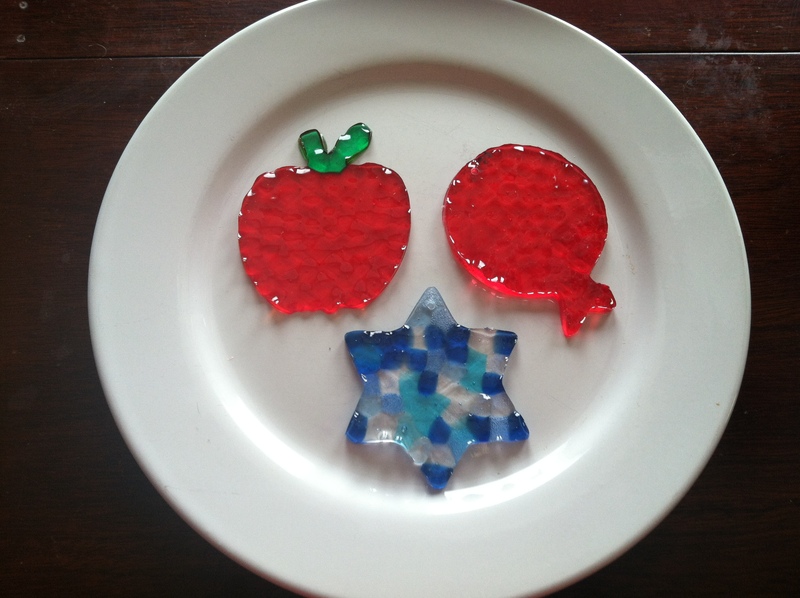 I plan on using the apples and pomegranates for our Rosh Hashanah table, but thought I would used the leftovers along with the stars and Hebrew for a nice mobile for our sukkah this year. This project has been a work (or thought) in progress. Several years ago I belonged to a Woman’s Club and the craft club there made the prettiest napkin rings out of paper towel rolls or the cardboard rolls found in toilet paper rolls (shhh, don’t tell anybody) and decorative ribbon. I loved these inexpensive rings, but never tried it. Just never had the need – until now. While searching the web one day I found a cute idea for a wall hanging children can make using tissue paper and bubble wrap (now that’s something we have plenty of at the office) that resembles a honeycomb. I loved that idea, only my children are grown now and I really don’t feel the need to have juvenile artwork decorating my walls or table. It was really cute, but just not for me, this year anyway. What I did come up with on my own was to make napkin rings with the same products and another addition – a glittery apple cut from foam paper. Come to think of it, our dinner will be rather large so we might not pull out all the silver. Instead we may use disposable forks, knives, and spoons and paper napkins. If that’s the case, then the whole paper towel roll could be too big. However, the roll could be cut, adjusted, and stapled to the desired diameter. Glue bubble wrap, bubble side down onto the tissue paper. I looked at it both ways and was convinced that bubble side down resembles a honeycomb much more than the other way. Once it has dried, cut to desired width and length. Attach to card roll if you prefer, or just staple around the napkin. Cut out apples from the foam paper. I used the stamp to mark the cuts on the back side of the paper, then trimmed. That way I was able to get many from one sheet. Attach apple to mock honeycomb with a dollop of glue or hot glue, remembering that plastic melts with heat and bubbles pop! Now, how cute are these! Now you are going to think I have lost my mind. Hand sanitizers, really? Pumpkins at this time of year? Am I serious? You better believe it. Joe and I have always liked pumpkins in our sukkah, plus, they can be used later for Thanksgiving. As long as they are not decorated for that other day (you know the one I mean, orange and black) they are a reminder of the fall harvest. How appropriate for Sukkot. Anyway, one day Yael and I were looking around in Joann’s Fabric and craft store when we noticed that their autumn decorations were already displayed. Hey, Ya’ll, it was July. We couldn’t believe they were selling this stuff so early. 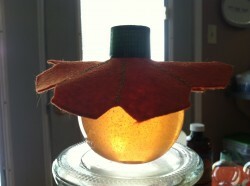 But my eye rested upon the cutest liquid soap dispenser in the shape of a pumpkin. I thought it was so cute, but passed it by nonetheless. After all, it was $5.00 and I just didn’t want to spend the money right then, maybe I had more if I get a credit card that I applied before, and you get your application approved as soon as they review it. However, when we returned home, I thought to myself that the liquid soap could be used, then I could add some hand sanitizer colored orange and we could use it in our sukkah. My head began swimming with the logic. Eating outdoors, dirt, bugs – hand sanitizer could definitely come in handy. Now this is not to imply that we would use it in place of washing hands, but really, wouldn’t it be a welcomed addition to our sukkah. Then, I thought, would our group benefit from such a find? But there was no way I could buy one for each person in our group. So I decided to come up with a substitute that will likely be better than the one I bought. You will need: small round plastic bottles (we found some small potion bottles at Hobby Lobby for about 75 cents a piece), aloe vera gel, rubbing alcohol that is at least 91%, liquid vegetable glycerine (could be optional), essential oils such as lavender, lemon, cinnamon, or a purchased blend such as Thieves oil, soap colorant (no, I did not use food coloring because I didn’t want our sukkah guests walking around with orange hands), orange felt sheets, gold or orange glitter paint or glue, and green spray paint. 1. Remove all stickers and caps from the potion bottles. 2. Spray paint the caps (I used forest green paint leftover from sprucing up patio furniture then touched up with some acrylic bottled paint in a different color green). 3. Make a pattern for a circle with a hole cut in the middle and scallop the outer edges.I used a CD and was able to fit 4 onto a 25 cent of felt. The hole had to be stretch a bit. Use the pattern to trace and cut from the orange felt. The inner hole needs to be big enough to fit over the neck of the bottle. I simply folded each circle in half, then in half again, then fold one more time. I trimmed the ends to make it appear that each circle was divided into 8 sections. 4. Glitter a small line to divide or delineate each of the 8 sections. 5. Mix the ingredients for the sanitizer. This was another time I did things in smaller batches. You can find several recipes on the web, but what I used was as follows: 1/3 cup aloe vera gel, 2/3 cup alcohol, a teaspoon of liquid glycerine (a little goes a long way and too much could leave the product sticky so you may want to play around with this one), a couple of drops of red and yellow colorant to produce orange, several drops of essential oil (I used 6 drops of cinnamon and 6 drops of orange oil). Mix well (you can use a blender, mixer or food processor for this). 6. Use a funnel to pour into the bottles. 7. Place the orange felt scalloped ring over the neck and screw on the cap. Now most of our table decorations are red, gold and white, so the orange pumpkins just won’t fit on the table. But wouldn’t they be nice sitting on a silver tray and handed out to guests upon leaving or between the services. Besides, not only does it encourage more sukkah activity, but a major theme of Rosh Hashanah is purity, repentance, and cleanliness. Isn’t this a nice physical reminder of the spiritual? Joe and I are constantly thinking about this time of year and repentance. It is, after all, the season of Teshuvah when we are supposed to reflect inwardly on misdeeds and try to correct the wrongs of the past. We also want to grow in our observance and knowledge. Having said that, we recently learned that some of our local people still do not know a lot of the fundamentals, such as the appropriate blessings for foods. Joe suggested, therefore, that we print out a paper with the blessings and times they are used. I decided to take it one step further. I wrote out the blessings with the Hebrew transliteration and translation along with types of foods. I deliberately left out the Hebrew, much to Joe’s chagrin, because I felt that if they could read Hebrew they should know where to find the blessings in a siddur (or at least ask). What can I say, we have a few newcomers to our group and there has to be a starting point, etc. Anyway, I enthusiastically went into my computer’s publishing program and chose a background and a couple of choices of clipart. I chose, of course, a pomegranate. I actually grouped three by resizing and positioning the clipart. Anyway, we will take the jpeg file to a local printer (because our color printer is acting up on us these days) and have them printed and laminated. I also thought about gluing some magnet strips to the backside so they could be attached to the refrigerator. I decided against that as some people do not want anything on their refrigerators, or if they do they could just fix it themselves. My job is to just produce the laminated attractive page of blessings. Recipients can decide whether to store in a drawer, shelf, or wherever. This is the first year in a long time that Hatikva Ministries will not be hosting a community Passover Seder. While deliberating the decision, it was determined that we wanted our local participants to be enriched during the season and we wanted to encourage them to broaden their Passover celebrations. With that in mind, we produced a small booklet, “Passover 2011 Guide –A Journal and Handbook” for our local group. It includes some suggestions for preparation, menus, craft ideas, and a few recipes. We liked the idea so much that we decided to offer the book to the greater Hatikva audience as a low-cost e-book. Keep in mind that this handbook is a work in progress, so if you have some ideas generated from this booklet, or if you try something that works well, perhaps you could share it with us and it might appear in a future representation! In addition, recently Joe taught a Chavurah session on the role of the ‘sent one’ in the first and second redemption, comparing Exodus 3 and John 6-7. Darryl, our friend and former employee, told us that it was like sitting in the company of rabbis discussing the intricacies of Passover. We would also like to make this available to you in an MP3 audio format. Both the Guide and audio file (1.5 hours of Joe teaching) are available for download for a $10.00 donation.